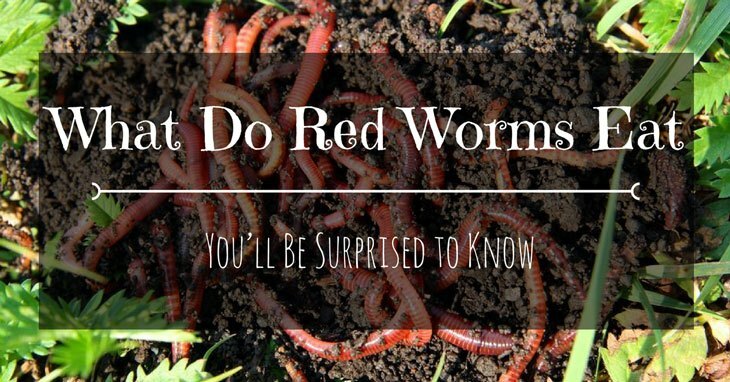 If you are a gardener, you might have already heard about red worms. They are also popularly known as red wigglers, manure worms or tiger worms. Whatever they are called, they are considered as the ﻿﻿best worms for composting. However, to get the most benefit from these worms, they need to be fed well. What Do Red Worms Eat? Red worms (Eisenia fetida) are scavengers. They feed on decomposing animal matter and decomposing plants. Compared to most types of worms, they are smaller in size. They can grow between 3 and 4 inches long. They are also noticeable for their alternating dark and light red color. Their bottom is slightly flat while the rest of the body is round. Red worms, just like other earthworms, play a crucial role in the ecosystem. They serve as food for larger animals such as birds and even fish. But the most important contribution of red worms in the environment has to do with composting. Worm castings offer numerous benefits to plants. If you have a backyard garden, vermicomposting using red worms provides you a good source of healthy soil for the plants. As red worms eat the organic matter, they leave behind their castings or poops. These castings are rich in phosphorus, nitrogen and potassium which serve as natural fertilizers for the plants. Moreover, having red worms helps create pockets of air in the soil. These pockets of air are healthy for the plants as they allow for the nutrients and water to easily flow to the roots. Red worms will not produce much castings if you will not feed them well. And do you know that they can consume food that is about the same amount as their weight? While it is general knowledge that red worms feed on organic matter, you can’t feed them just anything. There are some foodstuffs that are not suitable for red worms. There are also foodstuffs that will keep them healthy. Fruit and vegetable wastes – Red worms like eating cooked or uncooked fruits and vegetables (except for those belonging to the citrus family). These include fruits like bananas, plums, peaches, apples, grapes and mangoes. Vegetables such as lettuce, beans, carrots, peas and leafy vegetables are also considered as good food. Egg shells – You need to crush the egg shells first. Egg shells are rich in calcium which is great for the worms’ digestion and reproduction. Cooked egg shells are the best choice. You may also feed them raw egg shells but be sure to clean the shells before crushing and feeding them to the red worms. Coffee grounds – These are also an excellent worm food, but only to be included in moderation. Tree leaves – Leaves from common trees also serve as food for the red worms. However, you must keep these leaves in moderation. Also, avoid leaves from exotic trees. Garden cuttings – if you have garden trimmings and other garden wastes such as bean stalks, beet tops and pea vines, don’t throw them. You can add them to your compost bin as food for the red worms. Paper and cardboards – Make sure that these papers are not glossy. You can shred them to small pieces before feeding them to the red worms. Starchy foods – You can feed red worms with potatoes, rice, pasta and other grains but only in minimal amounts. Aged animal manure – Not all animal manure is suitable for food. To be on the safe side, just use those manure from vegetable or grass-eating animals such as rabbits and horse. Also, only feed manure that are days old already. Commercial food for worms – If you have limited supply of organic waste, you may also try feeding your red worms with commercially prepared worm foods. Acidic fruits – Stay away from citrus and other fruits that have high acidity levels. These include oranges, lemons and pineapples because they are not healthy for the worms. Meat and poultry products – Meat and animal fats are hard to digest and are not suitable as food for red worms. They also attract unwanted pests to your compost which in turn will cause odor buildup. Pet waste – Don’t feed red worms with dog or cat manure. Fats, oil and grease – Feeding them to red worms can cause odor buildup inside the bin. They can also make the compost acidic. Red worms are excellent composters as they easily reproduce and are easy to care for. However, the key to keeping your worms healthy is to feed them just the right kind of food. Feeding your red worms with the wrong organic matter often results to bad odor in the compost. Not only that, it will also attract maggots and other pests. It will also make the soil acidic. When that happens, you may have to first remove the maggots before you can continue feeding the worms. Or worst, you will have to start your compost bin all over again. Moreover, if you are just starting your compost bi﻿﻿n, a good way to ensure its success is to have a good mix of fresh beddings and waste material. You could let it sit for a week in the compost bin before adding the worms. Raising red worms and feeding them well offer many other benefits. Another major impact of red worms is in recycling matter that will otherwise end up in the garbage and ultimately in the landfill. Composting benefits the ecosystem by naturally recycling matter that might otherwise end up in a landfill. If you are a gardener who would like to start a vermicomposting bin, our list above may help you get started. You’ll have high success rate in getting healthy castings if you feed your red worms with the right organic matter. Red worms can offer you more benefits if you feed them well. If you find this article useful, feel free to let us know through the comment section. Also, don’t forget to share this article with your friends who might find it useful. Compost versus Mulch: How Do They Compare?